Stress is a major contributor to ill health in chickens and can also make them more prone to a number of vices such as feather picking, egg eating, comb or vent pecking. Chickens kept in intensive conditions are constantly subjected to stress which is why farmers see such high mortality rates and have to pay out to keep birds healthy and make them productive. Fortunately, keeping chickens in our back garden isn’t exactly intensive as long as they have a sufficiently large run or are let out of their run regularly to free-range although there are pleanty of other times when chickens can suffer from stress. In short, stress is best avoided whenever possible and a little bit of care and forethought can dramatically reduce stress in your birds. So how do we know what stresses chickens? Well, some years ago, there were studies done that measured the stress hormone ‘corticosterone’ of birds in different situations and it is this research that has enabled us to understand the stressors. As well as intensive conditions causing stress, the other main stressors can seem quite trivial to us. Handling. This is one of the biggest stressors. 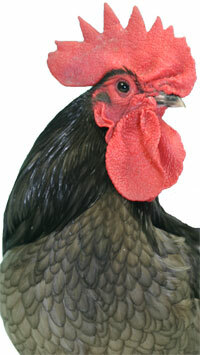 Chickens are a prey species so naturally, if caught and picked up, they become stressed. Whilst regular handling is important for health checks, chasing a bird around a run for 5 minutes every time will not help. Try to catch birds in a confined area such as a house quickly and calmly. Hold the wings firmly and then transfer the bird to the holding position with your right hand underneath her, breast in the palm of your hand, fingers holding the tops of the legs. Her head should be underneath your arm so her head is looking behind you. Use your left hand to examine her. Introducing new chickens. Chickens are flock animals that have a pecking order. It is thought the ancestors to our chickens, the Red Jungle Fowl of South East Asia use the pecking order to assist in their survival. If every bird has her place, when it comes to feeding time, each one can have her turn and they don’t have to spend precious time arguing which may alert predators to their where-abouts. Every hen knows her place in the pecking order and by introducing new birds, the pecking order is upset. No hen knows where she stands and this will cause arguments and considerable stress for days until they have sorted themselves out into a ‘new flock’. Lack of food or water. This stress is completely avoidable of course but we all have those one off days when we suddenly realise that our birds have run out of water for one reason or another. A leaky water container, frozen water or just a forgetful moment! Extreme heat. Chickens don’t sweat. To cool down, a chicken must either take on cool water (and excrete more to lose the excess fluids and some heat) or pant which removes heat through the air they exhale. Chickens are much better equipped to deal with the cold and can keep their body temperature up by eating more and trapping air inside their feathers to insulate themselves thermally. Heat will cause chickens to become stressed. A new environment. 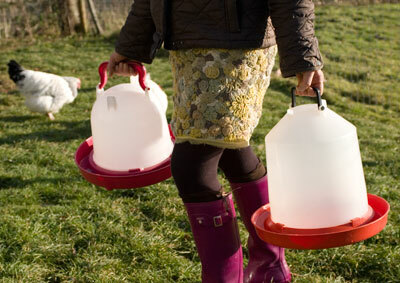 This can be taking a bird to a show, getting your birds for the first time or just moving them to a different house or run. Another environmental change that is hard to avoid but causes considerable stress for your birds is when there has been a covering of snow. Egg laying. This is surprising since this is a natural things that chickens do but egg laying does cause stress on your hens. Giving them a peaceful, private, darkened nest box can help. Try not to disturb hens that are in the process of laying. Predation. 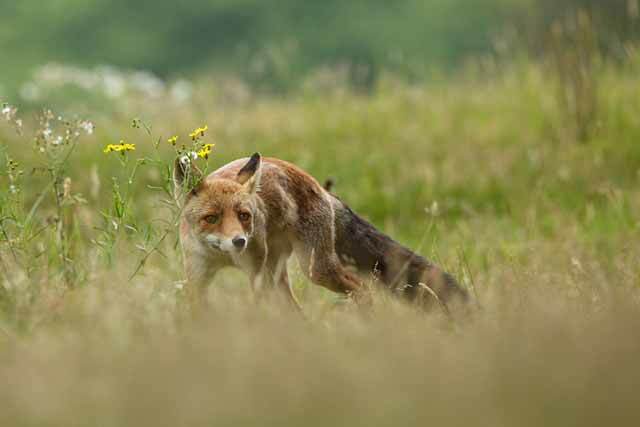 Foxes or other predators visiting the garden on a regular basis are likely to cause stress. In the extreme case, after a fox attack, even though a chicken may survive the wounds inflicted by a fox (he grabs a mouth full of her feathers for example and the chicken escapes), she can still die because of the stress. If you can minimise stress, your birds will be less prone to picking up disease which is something we would all like: happy, healthy chickens! Diarrhoea in chickens can be caused by many things, including a change in diet (most likely in your case) or excessive amount of greens. Also there are droppings that can look like diarrhoea but are in fact a caecal dropping which is expelled once every 24 hours or so. My 2 chickens, kept in a run in the garden, with plenty of space, have started eating their eggs, is there something lacking in their diet? They have layers pellets, grit, and lots of vegetable scraps and weeds. I would be grateful for any advice. Probably not, they have just picked up a bad habit, learning that eggs are really tasty! 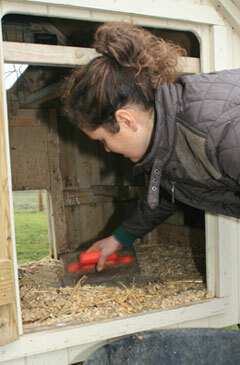 Collect eggs regularly, place golf balls or dummy eggs into nest boxes so they don’t have any success with those. Make nest boxes as dark as possible (hanging an old feed sack over half of the nest box can help). Some people blow an egg and load it with mustard / curry powder etc to put the egg eaters off but I’ve found the above to work well. I have 3 rhode island reds and 3 isa browns 19 weeks. They just started laying last week and I got eggs every day. Now I am down to 1 egg a day and have found 3 “soft ” eggs on poop board. I use Purina pellets and a little scratch at night. They have plenty of space, food and water. I set out additional grit and oyster shell. Are they stressed? I see chipmunk holes in their run?? Is this normal? Appreciate any and all comments! I’m not familiar with chipmonks (we don’t have them in the UK) but I wouldn’t really want them to be there if it were me, I would try to keep them out of the run. 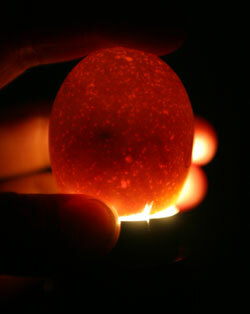 Hi i have a question relating to egg laying if you are able to help please. 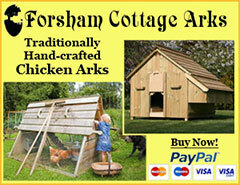 I had four chickens all were around 5 months old and 2 had just started laying but sadly a fox took two. One of the layers and one bantam. Now my head chicken hasn’t laid an egg since. Its not a problem as she is a pet but its been some 2 or 3 months since the fox attack, she is very healthy in general. Although its now winter here I was wondering if there would be any particular reason why she isn’t laying. Obviously the stress caused by the fox is a big part. I also have one drake left (he lost his brother) and my drake has attached himself to the chicken and I wonder if this gets on her nerves and causes her stress? He doesn’t attack her or anything he just follows her around like an annoying brother. Well, firstly, the drake should have company of his own sort. He will have made friends with the chicken but really should have a ducky friend or two. If you can’t get ducks, you can get more drakes easily – you can keep all drakes together if there are no ducks. Do not be tempted to buy a pair because the female will suffer from too much attention from the drakes. 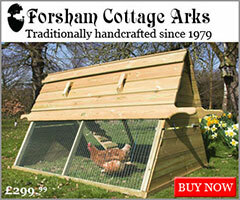 Secondly, at this time of year, there is not enough light for most chickens to lay. Keep them well fed (not too many treats though!) 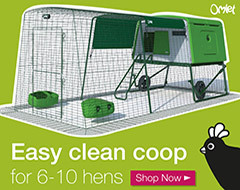 keep their bedding dry and house draft free and before you know it spring will be here and more than likely some eggs! But with the stress topic, we have had two more chickens hatch and one of them is a rooster, We also have two more roosters who are starting to pay their services (if you know what i mean). are my hens stressed and what can i do about it, because they are not their usual selves and they are looking tired. Can you be more specific – what sort of eggs are they laying? How often? What are they fed? Also, where in the World are you and is it winter time where you are? Daylight hours will affect their laying. What do you think is causing them stress? Is there something that’s upsetting them that you suspect? Odd for sure. Without more detail, I’m not sure what to suggest. Any holes (rat holes) again, they will get scared if a rat has popped its head out. Or they are just new and will settle in? I can’t think of any other reasons without more details.. sorry.